The ‘end of the year’ lesson is always a tricky one for me. 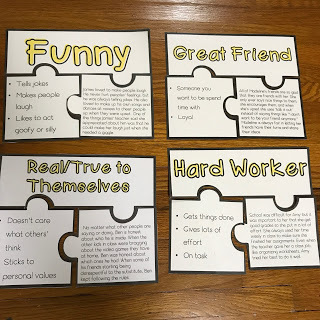 My goals for my lessons are usually for students to learn and start using a specific SEL skill. I could do this in May, but with only a short amount of time remaining in the year, the timing isn’t ideal. This leaves me with doing a reflective lesson, a warm fuzzy lesson, or a ‘next year…’ lesson. 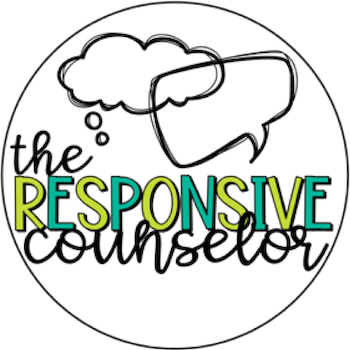 My 4th grade group this year wasn’t the warm fuzzy type and one of their teachers recommended something about reputations – which I thought was a great idea! Our next activity was a bit like the game Headbanz. 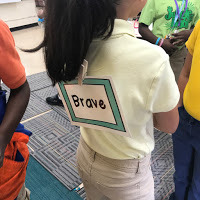 I put a card with a (positive) reputation on everyone’s backs and challenge them to figure out what there’s is by asking questions and by others giving clues. I modeled what this could look like with a student first for those that hadn’t played a game like this before. My first class I used masking tape…then I wised up and used clothespins! 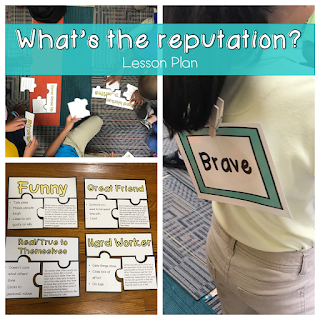 After each student correctly identified their reputation, they moved it around to the front of their shirt and helped others. After everyone was done, we circled up and I explained the directions for round 2. 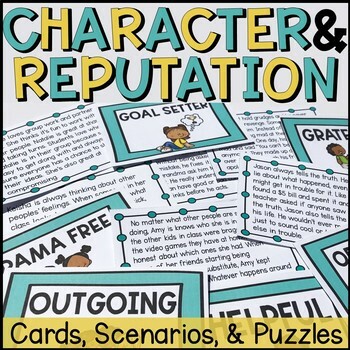 I gave each student a little character scenario card and then tasked them with finding the reputation that went with it. 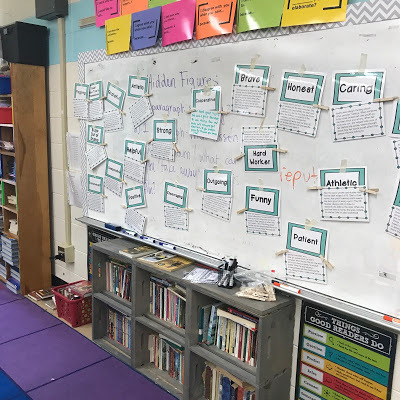 Students clothespinned the reputation and scenario together and taped them to the board. This was a challenge for my classes! There are some nuances between the reputations that were a bit tricky. Since the second part of that activity was pushing it with my higher homerooms, I made an alternate activity for my other rooms. 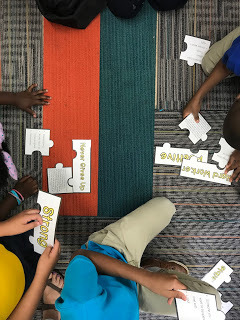 After playing ‘What’s my reputation?’, I gave each student a piece to a reputation puzzle and they found their matches and laid the puzzles out on the floor. After this, we joined back together to talk about the importance of developing a positive reputation. 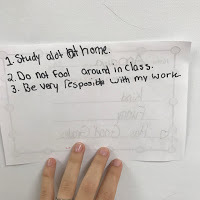 This was tricky for me to navigate because most of them can recall at least one time when I said “Who cares what they think about you?” I gave some specific examples about how their reputation effects whether or not their middle school teachers will believe them and whether or not people will want to be their friend next year. 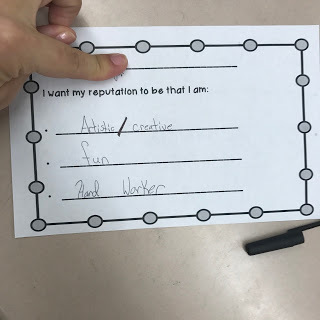 We closed the lesson with a personal reflection/exit ticket where I asked them to identify what they want their reputation to be in middle school and how they can earn that reputation. Many of them used the scenarios/puzzles to help generate action steps. One way I think I’ll edit this lesson in the future is to consider spending an entire lesson on the importance and impact of reputation before having them explore their own reputations and reputation goals. How am I going to do that? Dunno. But I’ve got all summer now to think it out! 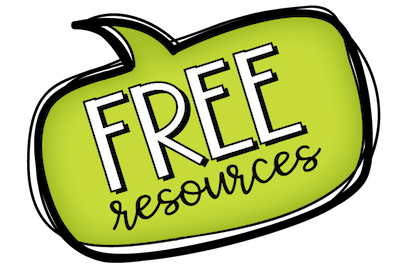 If you want to buy all of these materials ready made, I have them here in my TpT store, with a SCOOT option as well – just click the image below. Half off for the next 24 hours! I like the idea of putting a reputation on the back of a shirt and students guessing what their reputation might be! 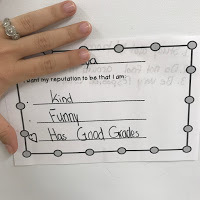 I often use the book "Each Kindness" to teach about reputation. Another (short) video that might be good to use (to stop in the middle and talk about reputation) would be "The Present" (search for it on pinterest). 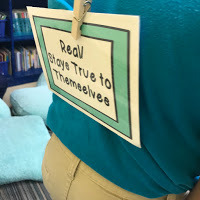 My teachers LOVE 'Each Kindness' – it's on 3rd grade's interactive read aloud list in ELA at our school. 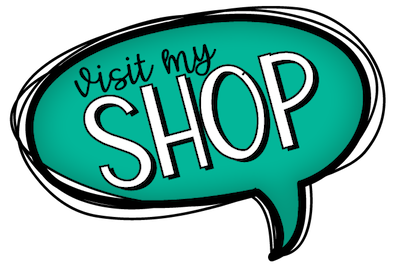 I need to take a look at that video – I love finding new clips to use! Thank you!